Monday, May 3, 2004 is another red letter day for Hibernians FC. The Premier League match against Sliema Wanderers has a special significance for the Paolites because it will be their 1,000th consecutive league match in the top division of Maltese football. This is a national record, which much older and more successful clubs have never achieved. Sliema Wanderers, Floriana, St George's and Hamrun Spartans were relegated before they reached this figure while Valletta, although they have never been relegated, started their league career in 1944 and are still some way from reaching the magic number. 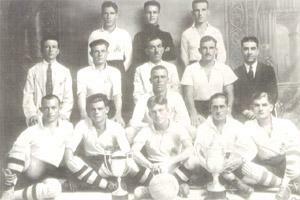 Hibs joined the MFA in 1932 and they first took part in the league in 1932-33. That season, the First Division was restricted to four clubs. Sliema and Hamrun were given a place outright, while Hibernians, Sliema Rangers, Vittoriosa and Pietà had to play qualifiers. When the draws for the two qualification matches were made, the Rangers were drawn to meet Vittoriosa while Hibs had to play Pietà. Rangers found little difficulty in beating Vittoriosa 4-1. In the other match, the more experienced Hibs were too strong for Pietà. They scored two quick goals in the first half, through Honey and Turu Theobald, and then added three more in the second half. Noon saved a penalty for Pietà but the 5-0 result did not flatter Hibernians at all. Hibs played their maiden match in the league on January 28, 1933 against the Rangers. The latter had the distinction of scoring the first league goal of that season but it was not enough to give them victory. The few spectators present saw Moore open the score from a cross by Frendo. Hibs retaliated immediately; Honey crossed and Busuttil headed into the net. On the resumption, Turu Theobald and Honey forced their way through the Rangers' defence as the former allowed his colleague to take the final shot at Lambertini who was beaten for the second time. A few minutes later, Theobald banged in another goal to give his team a 3-1 victory. It was a good start for Hibernians. Time passed and with it the club grew in stature. Before Monday's match, the Mayor of Paola will present a commemorative trophy to the team in recognition of the club's achievements in the Maltese Football League. A football tournament is also going to be organised for the occasion by the Hibs Ghajn Dwieli Football Nursery. When Hibernians play Sliema Wanderers on Monday, they will be playing their 1,000th successive league match in the Malta FA's top division - a significant achievement in Maltese football. To celebrate the event, a number of activities are being held on Sunday. At 9.30 a.m. there will be a Thanksgiving Mass at Christ the King church. This will be followed by the unveiling of a commemorative plaque at the club in Paola square. At 6 p.m. a match between current squad members and a team of former players will be played at Corradino. Those interested in taking part may contact Hibernians FC official Jesmond Abela on 9982-8291. The club is urging members, former players and committee members, and supporters to attend the activities. Hibernians 1932 - (Back row) Miller, H. Edwards, J. Edwards. (Middle row) Cilia, Theobald, Gauci, Miller, Manchè. (Front row) Farrugia, Formosa, Honey, Busuttil, Mifsud. Squatting behind Honey is Mizzi.